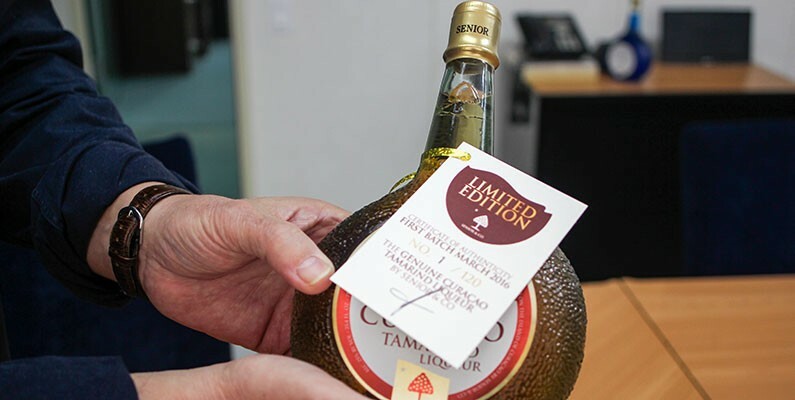 Gregory Elias received the very first bottle of the Tamarind Liqueur. The reason is the enormous contribution of his foundation Bon Intenshon to the island of Curaçao in the past years. Senior & Co, a Curaçao-based company, has great admiration for any person or organization that also has Curaçao at heart. Fundashon Bon Intenshon has put Curaçao on the worldwide map through amazing international events. The driving force, Gregory Elias, is a modest man and keeps out of the spotlights, but he deserves to be thanked for his efforts. “This feels really special and therefore this unique bottle will never be opened,” comments the proud Gregory Elias. In honor of the 120th anniversary, Senior & Co, released a special liqueur with Tamarind taste. The taste is inspired by the local Curaçao Warapa juice. De first 120 bottles of the first batch are certified and numbered. Number 1 of this limited edition was presented to Fundashon Bon Intenshon.